These individuals are inadmissible to Canada and are the subject of an active Canada-wide warrant for removal. 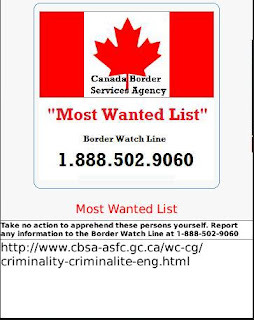 These individuals have failed to comply with the Immigration and Refugee Protection Act and have criminal convictions in Canada. 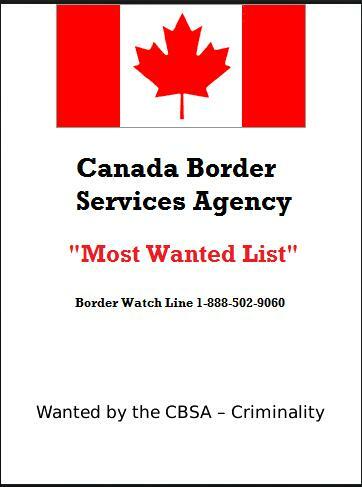 Take no action to apprehend these persons yourself. 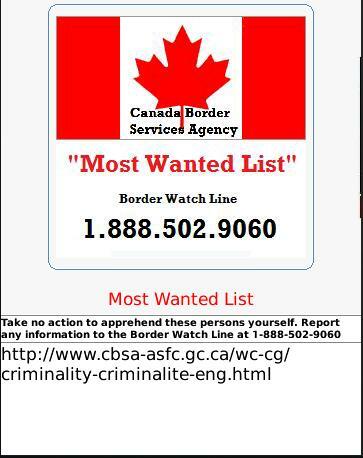 Report any information to the Border Watch Line at 1-888-502-9060. Aside from having a good story and a good BlackBerry children's book app developer, you'll need some interactive elements in order to self publish and get your children's book approved as an app. If not, you'll be told to publish your book as an ebook. Besides, the BlackBerry can do so much more for your children's book than just plain text and pictures. With that in mind, there are some key elements that you'll need to work on in order to give your BlackBerry children's book developer a clearer idea of how you want your BlackBerry children's book app to appear and function. The steps outlined below will provide a solid foundation for you to work with an BlackBerry children's book app developer to complete your app. You should be able to do quite a bit of the work on your own using a graphics program such as PhotoShop, PhotoPaint, etc., a text file editor such as Wordpad or MS Word, and a spreadsheet program such as MS Excel. For each file you create for your BlackBerry children's book app, it's important to begin with, and stick with, a good file naming structure. For example, if your app is called "MyApp", and you have an image of a rabbit on page 3, then you'll want to name that file something like "MyApp_rabbit_1_page3_xxyyzz.png", where xxyyzz is month/day/year. This becomes even more important when you have many images, or many revisions of images to work with. 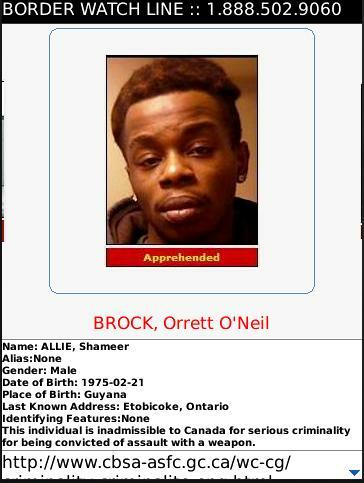 Otherwise it's very difficult for everyone involved to be sure they're working with the correct image. 1) Create a text file containing the text for your story, broken down into sections for each individual page of your app. This can also a good place to add notes for each page to help your BlackBerry children's book developer during development. You can choose to add your notes to this text file, or a better method is to create a separate Excel spreadsheet that details each page in your BlackBerry children's book app. 2) Create a rough storyboard for each page in your BlackBerry children's book app. These pages would include the startup splash screen, title page, index page, help page, story pages, etc. Each page should be a rough pencil sketch of the background art, characters, objects, and text. The purpose is to get a rough idea of how everything is going to fit on the page, and how the pages will flow together. The background images should be 1024x768 pixels in size, PNG format, enough to fill the BlackBerry screen. 3) Once you have your first storyboard pages completed, identify elements, characters, etc. that you'd like to be interactive or animated. These items will need to be drawn as separate images later to be able to animate them. For example, you may want to be able to touch a ball and have it bounce across the screen. To do this, the ball needs to be drawn as a separate image with a transparent background so your BlackBerry children's book app developer can animate the ball. The typical file format for these images are PNG, and the size should generally be the size that you need on the BlackBerry screen ( relative to the 1024x768 background image ). Sometimes you may want items created in a larger scale, if you for example want to be able to make the item larger when touching it, etc. Having your BlackBerry children's book app developer working with you at this stage is ideal, as they can help you identify the best ways to animate and interact with your BlackBerry children's book app. 4) Once you've worked out all the items you'd like to interact with or animate, now it's time to complete the color background images for each page in your BlackBerry children's book app. This will also help you to choose the color and placement of text, characters, and other elements that you'll use in your BlackBerry children's book app. 5) Now that your background images are ready, it's time to work on the characters and other items in your BlackBerry children's book app. These items are placed on the BlackBerry screen in layers. So think of your background image as layer 1, and then your other items are added in layers on top of that layer. For example, for a character to sit on a chair and have both animated, the chair and character would need to be seperate images. The background image is placed on layer 1, the chair on layer 2, and the character on layer 3. That way the character is in the foreground, and the chair is behind it. You can use as many layers as you need. 6) Now that you have color background images, text, characters and items created, it's time to place this all together into a new set of storyboard pages similar to those in step 2. 7) Once your color storyboards are ready, it's time to start thinking about sounds. You may want background music, narration, and sound effects for certain items in your BlackBerry children's book app. Audio files can increase the size of your app significantly, so it's best to keep sound effects to a few seconds or less, and keep background music to short loops to save space. The typical file format for your audio files would be either mp3, caf, or wav. 8) Now it's time to start working on the icons for your BlackBerry children's book app. It's important to think of your icons as one of the first things people see about your app. It's a first impression, and also tells people something about your app. It's also important to think of how your icon will look in the different sizes requried. For example, your main icon as seen on App World is 512x512 pixels, and the icon seen on the BlackBerry main screen is 114x114 pixels. These 2 icons need to be the same image, but different scales. There are other sizes required, but these are primary icon sizes that you should consider in this first pass. Typically you only need to give your BlackBerry children's book app developer the 512x512 pixel icon image and they will create all of the other icons from that image. 9) Now that most of the foundation details for your BlackBerry children's book app are ready, it's time to sign up as an BlackBerry developer. To do this, go to the RIM developer website ( http://blackberry.com) and sign up as an BlackBerry Developer. The current fee is waived per year, and that fee is for as many apps as you want to self publish. Once you've completed the sign up process, contracts, and banking information, you'll be ready to register your first app for submission. Even though your app may not be ready for submission, you can still register the name for your app which can hold the name for you for 90 days. To prepare your BlackBerry children's book app for submission, you'll also need to write a description for your app for App World, and use the 512x512 icon and some of the color storyboard images as temporary screenshots. It's also a good idea to have a basic website setup to promote your children's book app for BlackBerry, as well as a support email address where customers can reach support. For what I call stage 1 of app discovery, for your app description, focus on the first 3 sentences as viewed on an BlackBerry, and first 2 sentences as viewed on App World via a PC. These both work out to be the first 214 characters and are the text that people see before they click on anything further. Also think carefully about your app description keywords. These are added in a separate line when you prepare to submit your app, and are used for App Store SEO to drive customers to see your app in the App Store. A good test is to use an iPhone and BlackBerry device and search for your keywords in App World and see what apps come up. 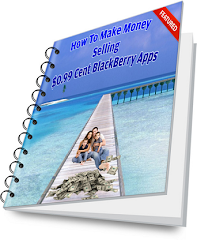 10) Once you've completed all of the steps above, if you haven't already, it's time to bring in your BlackBerry children's book app developer to review and work on helping you build and guide you through the rest of the process of how to self publish your children's book app for BlackBerry.